You all know how an Aaron Sorkin movie works, regardless of who the director is. People talk quickly, using a remarkable vocabulary, discuss complicated topics swiftly, all while walking around at a fast pace. You can't look away for a minute or you'll miss something. I love it. 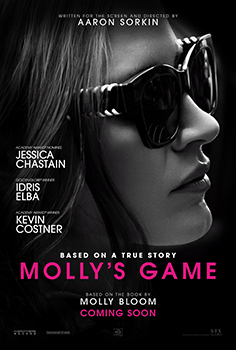 With Molly's Game Sorkin has taken over the directing himself and shows himself to be quite skilled. He has delivered a solid, entertaining, quick paced movie about people talking which has you on the edge of your seat. But none of this would have worked without his star, Jessica Chastain, who lives and breathes Molly Bloom into vibrant life. She takes this biopic and creates a fully realized hero, flawed and difficult and admirable as all hell. She delivers on all the promise she has displayed so far. On the surface Molly's Game is about the world of high stakes private poker parties but in reality it is about how men set up and perpetuate a world where women cannot get ahead. Chastain acts out this catch 22 perfectly making the case for this injustice succinctly and clearly. From her dad, to her employers, to the men she makes her living off of, to the US government, she is screwed over time and again and comes out on top. The film's whole arc is about how she is the only one who manages to act honourably and succeeds despite that. The film's only man who acts with any integrity, likely by no coincidence played by a black ma, Idris Elba, does so for his daughters sake. He is the father Molly wishes her father was. But even he wants compromise with the system. Only she has the "nuts" to withstand the pressure and remain admirable. Molly's Game is a clear, if not sometimes heavy handed, indictment of patriarchy. Sorkin fumbles this a bit near the end with a clumsy, unlikely meeting between Molly and her father (Kevin Costner) where she ends up comforting him in his failure. In someways this fits with the theme of men just not being enough and only women having the strength and integrity the movie's morals demand. But the scene happens so awkwardly I didn't feel it worked. And the film is too forgiving of him. Still, Chastain delivers an amazing performance and the film is one damn entertaining two and half hours, whose message is clear and poignant in this day. Gamble on this and it will pay off.